"Let no debt remain outstanding, except the continuing debt to love one another, for he who loves his fellowman has fulfilled the law," Romans 13:8. Americans hold approximately $1 Trillion in consumer debt. The biggest problem is credit cards. Government estimates reveal that the average credit card debt in America is just over $4,000 per person, or $8,000 per family. "The borrower is servant to the lender" Proverbs 29:11. Many people are enslaved by Credit Card debt. However, you don't have to remain in debt. There is good news for those who wish to get out of debt. If you exercise some self-discipline you can do this without the assistance of an advisory company. Get your family on board and do this on your own. There is no need to pay someone to advise you on how to get out of debt. Avoid debt consolidation companies. This reflects on your credit score like a bankruptcy. You can do it! Thousands have learned a simple secret which has enabled them to rid themselves of debt. You can gain control over your debts by following a few simple tips. Develop your personal strategy to get out of debt. Establish an emergency spending fund with a minimum of $1,000 cash. Save and deposit your $1,000 in the bank before you attempt to get out of debt. There is a very high probability that you will need to dip into it when your car breaks down, or your refrigerator goes on the blink. STOP charging to your credit cards and start paying Cash for all your purchases. NO CHEATING! Select your credit card with the SMALLEST balance and concentrate on paying it off as quickly as possible. 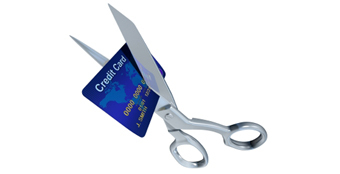 Continue making minimum payments on your remaining credit cards. Call your credit card companies and ask them to lower your interest rate. If you have good credit and have been making payment on time they will often reduce your interest rate as a reward for your business. When your credit card with the smallest balance is paid off, begin concentrating upon your credit card with the next highest balance and pay it off in the same manner. Continue making minimum payments to all your other credit cards. Paying Cash for all purchases. When your second credit card is paid off, begin concentrating upon your credit card with the next highest balance and pay it off in the same manner. 10. Continue following the process until all your credit cards have a Zero balance. Never charge on them again. Cut them up. If you choose to maintain a credit card for personal convenience, there are some things you can do. You can save money on credit card interest. Pay your balance in FULL each and every month. Paying your balance in full means you pay NO INTEREST that month. Make a pledge to yourself to the effect that if a month comes along when you are unable to pay your balance in full you will immediately stop using your credit card. You can help control your spending by transitioning to cash. ATM cards are like cash and can be used accordingly. The pioneer in the Christian Financial Movement, Dr. Larry Burkett developed a system to enable people to pay cash for all their purchases. It is simple, easy to use, and works beautifully. Purchase a box of large envelopes. Make a list of all your monthly expenses. Include the dollar expenditures beside each expense. Label an envelope for each one of your expenses. Examples include: Housing, Utilities, Food, Clothing, Transportation, Entertainment, Tithe, Miscellaneous, etc. Each payday deposit an appropriate amount of cash into each individual envelope. Pay your bills with the cash from each envelope. Never borrow from another envelope. Use this system and make refinements as you go along. Strict adherence almost always guarantees success. Use this system perpetually or until you get a grip on your finances. Make the Transition to cash starting today! Pay CASH for everything!!! It is truly LIBERATING to be DEBT FREE!!! One of the toughest things about using an ATM card is keeping up with your balance. A five dollar purchase here and a fifteen dollar purchase there every few days can add up to a few hundred dollars each month. You can get a grip on your ATM card usage. Keep ALL your ATM / Debit card receipts. Know your balance at all times. Keep a running balance on your ATM / Debit card just like you would for your check book. Avoid overdraft penalty fees like the plague. They average $30 a pop. Two or three of these per month hurt like crazy. Check your balance online. Most ATM / Debit card issuers have secure web sites where you can check your transactions and balance as often as you wish. Don't let your Debit card out of your sight. Retail stores, restaurants, etc. Many have fallen victim to the scam where an employee swipes your card on their personal reader and then accesses your money. A few suggestions to help get you started. Learn to live on what you earn. Add ideas of your own. Get involved in some senior activities, travel, gain some new experiences. Ask around, chances are real good that you will be able to find others who are looking for some exciting things to do and exciting places to go and you can team up with them.